Daddy & Co. is dedicated to providing dads in every stage of fatherhood a way to proudly proclaim, "I'm the Daddy!" Daddy & Co. is committed to excellence and strives to deliver quality products at great prices while ensuring the highest level of customer service and satisfaction. Daddy & Co. is dedicated to families everywhere, and each I'm the Daddy product is designed to encourage involvement and engagement between Dad and Child - from the delivery room on. Above all, Daddy & Co.'s mission is to build a sense of community where daddies everywhere can come together to share in their pride and belonging. Daddy & Company's Electric Guitar Dad Tee is the perfect gift for every musical dad. The charcoal grey shirt is made of a cotton-poly blend that's soft to the touch; it will become daddy's favorite shirt in no time! 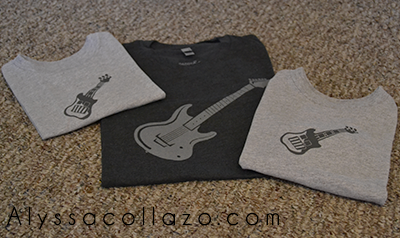 The light grey guitar design contrasts nicely with the dark color of the shirt, and there's even a matching Toy Electric Guitar Toddler Tee! Now dad and toddler can jam together wearing their matching Electric Guitar Daddy and Toy Electric Guitar Toddler Tees. When purchased together these matching music tees make the ultimate gift for any musical daddy-toddler duo! My fiance loves his Dad Tee and my girls love matching Daddy with their Toddler Tee's! It's adorable watching them jam together, especially in there matching Tee's. You can get the Electric Guitar Dad Tee for $24.95 and the Toy Electric Guitar Toddler Tee for $16.95. These soft Tee's make the perfect Christmas gift. You can find the Electric Guitar Dad Tee HERE and the Toy Electric Guitar Toddler Tee HERE. DISCLAIMER: All products received are complimentary for testing purposes from Daddy & Company. All opinions stated are my own and are not influenced by any affiliates. Looks like a great shirt! My father isn't into music that much, but cars are his thing so I usually go with that! Those shirts are way to cute! Very good gift idea! Those are adorable. My husband is a musician and I know he would love these for both him and our kids! This is the coolest! I love that daddy and baby can be matching. That is just adorable. so cute!!! they would be great daddy and me gifts for the lil ones to look like their dads! Omg those shirts are wayyyy too cute!!! Lobe them!!! How cute to match Dad, and the guitar design is really nice! I like the colors of these too! Now this is right up my alley! My husband is a musician and he's really into these kind of shirts. I'll have to pass this link on to the other wives in the band. Thpse shirts do make a really cute daddy and me gift! I've heard so many great things about this company :) Really love their selection. Those T-Shirts looks so pretty and cute. Guitar design is really nice! I like the colors as well. One of the best gift for this holiday season to try for my husband. Those are some cute shirts. My son or husband would love them. Thanks for sharing. Those t-shirts are super cute. What a great gift idea! Nice T-Shirts! I know hubby would love to have one of those.